The provision of IP-based multimedia services is one of the most exiting and challenging aspects of next generation wireless networks. A significant evolution has been underway for enabling such multimedia services and for ultimately migrating the Internet to the wireless world. 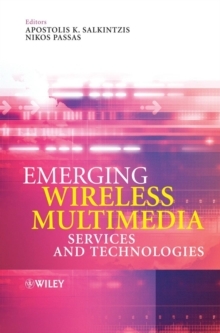 This book examines this evolution, looking at an array of the most up-to-date wireless multimedia technologies and services. The first part focuses on enabling technologies for wireless multimedia, while the second is dedicated to the new wireless multimedia services that are expected to play a key role in the future wireless environment. In addition, the related recent standardization, research and industry activities are addressed. Covers a complete range of multimedia hot topics, ranging from audio/video coding techniques to multimedia protocols and applications - Discusses QoS issues in WLANs, 3G and hybrid 3G/WLAN networks - Provides in-depth discussion of the most modern multimedia services, such as Push-to-Talk, Instant Messaging, Presence, mobile payments, MMS, WAP, and location-based multimedia services - Addresses the emerging Multimedia Broadcast/Multicast Service (MBMS) and the key aspects of IP Multimedia Subsystem (IMS) in 3G networks - Numerous on-line references will assist readers in their quest for the most up-to-date information This comprehensive resource will have instant appeal to students in electrical and computer engineering or IT disciplines. It is also essential reading for engineering managers, engineers in wireless systems and multimedia, and wireless multimedia researchers.